This Irish Santa decoration is named Spot of Tea and he features a tea service with shamrock accenting and a wooden tray and bench. He is dressed in a green and white Santa outfit and he is munching on shamrock shaped cookies. 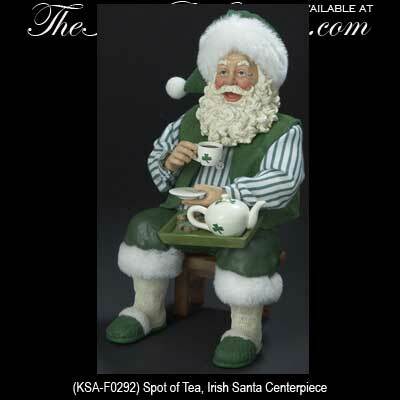 The seated Irish Santa is 8 1/2" tall and is made of porcelain and Fabriché by KSA. The Irish Santa centerpiece is gift boxed with a shamrock history card that is complements of The Irish Gift House.